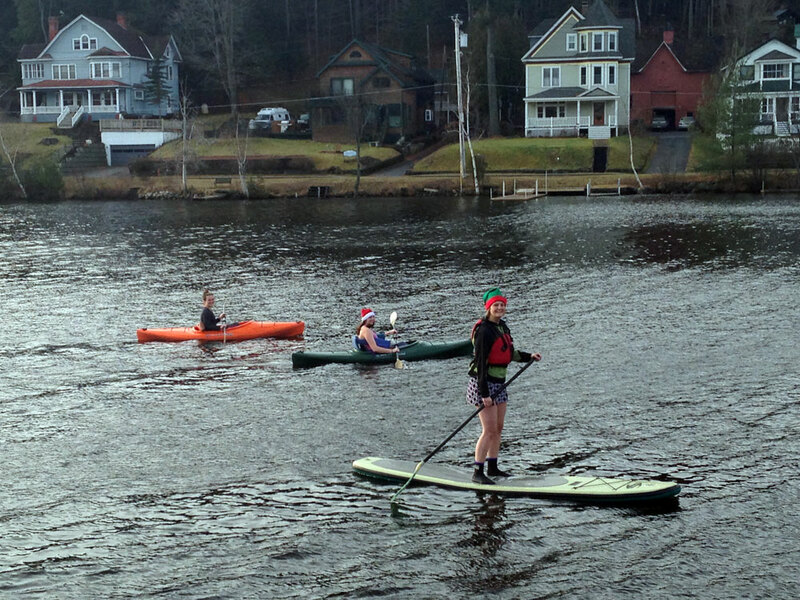 It wasn’t a good omen for the rest of the winter when Trish Wickwire of Saranac Lake went stand-up paddleboarding on an ice-less Lake Flower on Christmas Eve last year. The 60-plus degree temperatures that day spurred other people to go kayaking or play golf. It all turned out to be a sign of what was to come. Warm weather, rain and the lack of snow during the winter of 2015-16 hit the area’s tourism- and snow-dependent businesses hard. The state Olympic Regional Development Authority took a big hit from the winter that wasn’t. It saw its operating revenues plummet 25 percent from the prior year. “(This was a) direct result of the bad weather across the Northeast, the industry reporting average decreases in visitation of about 28 percent,” reads ORDA’s annual report. Total skier days at Whiteface Mountain Ski Center dropped to 167,501 from 216,219 in 2014-15. The number was the lowest for Whiteface since 2011-12 and the second lowest in the past seven years. Whiteface received just 58 inches of natural snow and more than 17 inches of rain compared to a typical average of more than 100 inches of snow. Lake Placid’s cross-country skiing venues also suffered. Mount Van Hoevenberg, which ORDA runs, was forced to close numerous times throughout the season. The annual Lake Placid Loppet cross-country ski race at the mountain was canceled. At Cascade Cross-Country Ski Center, Manager Jennifer Jubin said the center operated at about 50 percent most of the winter. In the Saranac Lake area, Mount Pisgah Ski Center was only open 51 days compared to the usual 80. Crews at the area’s cross-country ski areas, Dewey Mountain Recreation Center and the Paul Smith’s College VIC, also battled rain and icy conditions, struggled to stay open and canceled some of their programs. In Tupper Lake, Big Tupper Ski Area, which has been run by volunteers and has no snowmaking capacity, didn’t open at all. Seventy percent of winter business at Charlie’s Inn in Lake Clear comes from snowmobilers, so the lack of snow had a “tremendous” impact, according to owner Jill Brockway. Heidi Schuller, whose son owns the 18-room Tupper Lake Motel, said in late February that the lodging facility was empty every weekend there had not been an event in town, like the Northern Challenge Ice Fishing Derby. Businesses in Lake Placid also reported a decline in revenue, but they said events like the Empire State Winter Games and CAN/AM hockey tournaments helped to somewhat mitigate the impact. 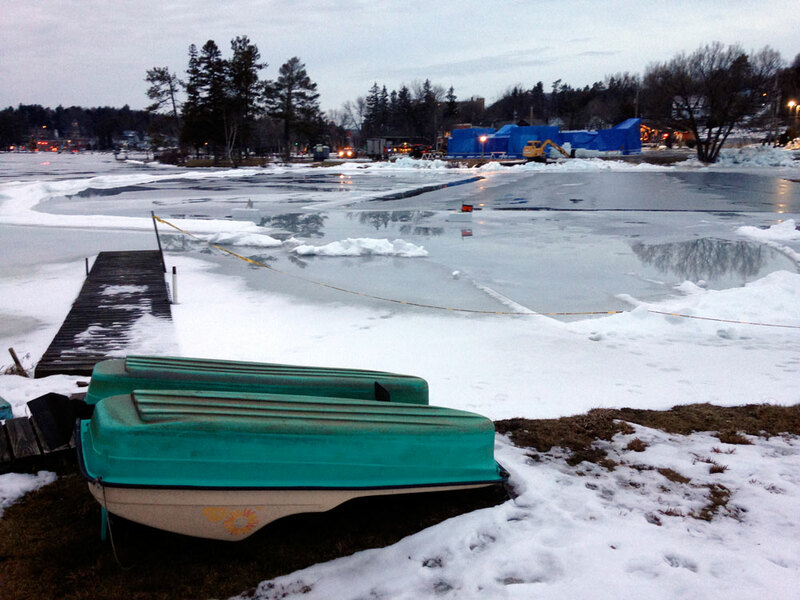 The lack of cold temperatures and winter weather in December affected the size of the blocks cut from Pontiac Bay to build the symbol of the Saranac Lake Winter Carnival, the Ice Palace. Instead of the nearly 2-foot-thick blocks cut last year, this year’s were about 12 inches thick, meaning volunteers and crews of state prison inmates had to cut more blocks and pile up more rows to get the palace to the necessary height. Work on the palace stalled for four days the week before Carnival, and the palace was draped in blue tarps until the day before it started to protect it from rain, wind and mild temperatures. Shaved ice from Lake Placid’s Olympic Center had to be trucked in to build the obstacles for Artic Golf in Prescott Park. Some on-ice first weekend events had to be rescheduled or modified due to concerns about the safety of the ice on Lake Flower. By the time the parade rolled in, however, the weather had turned dramatically colder, with temperatures of 10 to 15 degrees below zero, and even colder wind chills.